People are often looking for inspiration for Mother’s Day craft ideas for kids. 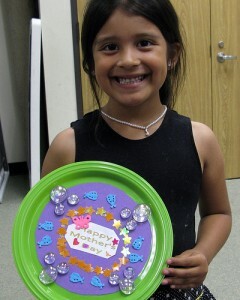 There is no gift more special for a mother on that special day than a personalized hand made present from her children. The range of gifts which can be crafted is limited only by the imagination. There are several benefits to children making their mothers gifts for Mother’s Day. The first has already been mentioned, which is that something which is crafted shows more thought, and makes a more touching gift, than something which is store bought. Secondly, gifts can be made very inexpensively, therefore saving the costs of buying from a store. Lastly, it encourages children to be creative, which is not only fun, but also aids in their development. Mother’s Day craft ideas for kids can come from many sources. There are many websites and books available to help with inspiration. The children themselves may have some very good ideas about what they can make. Some crafts are incredibly easy to make, but still make very effective presents. For example, a piece of string and some beads can make a very nice, colorful necklace, bracelet or anklet. Pasta shells can also be made into jewelry, as well as being painted and glued onto card to make an artistic picture. Moreover, a very simple drawing or painting by a child can be put into a frame to make a highly personal gift. Children can also put their painting skills to use on mugs and plates to create something unique for their mothers. They may also wish to complete the set by painting a picture and gluing it to thick card to make a personalized place mat. Nature can inspire some very creative Mother’s Day craft ideas for kids. Mothers generally tend to enjoy displays of flowers, and these make a very easy yet effective craft project. Not only can they be put in a vase for a nice floral display, but they can also be pressed into a book. Attractive floral gifts can also be made by fashioning paper, card or fabric into flower shapes. There is a huge variety of objects which can be crafted for mothers using air drying clay. This can literally be fashioned into any design a child likes, and painted to create wonderful gifts. It is very popular to incorporate a magnet into these designs to make fridge magnets. They can also be made into key rings and brooches. In fact, the child’s imagination can be left to run wild. In all of the examples listed it is important that children receive not only adult supervision, but also the encouragement to be creative. Mothers will certainly always appreciate receiving personalized gifts made with love. Mother’s Day craft ideas for kids should create fun projects and unique, thoughtful gifts. Are you still looking for the perfect Mother’s Day gift? Check out our free guide with the top 50 Mother’s Day gift ideas for 2011.
its really good to hear about such wonderful ideas . i also planned to make album of me n my mother pictures and want to send it to her, in this way i may helps both of us to go back in good precious memories just in few minutes. we all should give memorable gift to our mothers they are not less than a legend for us.